Hummingbird feeders are available in many materials, sizes, shapes, looks, and types, so how can you tell which one is right for your back yard or porch and circumstances? All of these feeders will use the same type of hummingbird feeder recipe, which is simply a nectar made from a mix or sugar and water, but they will be filled and release the nectar in different ways. Some hummingbird feeders offer places for the birds to rest while they eat, while others cause the birds to eat while hovering. It is generally believed among bird experts that the resting feeder is a better choice, and is frequently preferred by the hummingbirds who visit. Squirrel proof bird feeders are not usually found in feeders that are intended for hummingbirds, because these devices use small holes to allow the birds to insert their tiny beaks and lap at the nectar inside. Wasps and bees can pose a problem though, because of the sweet nectar, so there are hummingbird feeders designed to keep these pests out by eliminating any nectar drip or seeping. If you spill at all while filling the feeder make sure to wipe the spill clean with a damp cloth. Usually only feeders that contain seeds, nuts, and fruits, such as goldfinch feeders, become the target of squirrels and other small creatures. 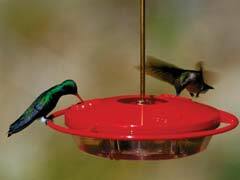 The main body of all hummingbird feeders will usually come in one of two types, the bottle or dish. The bottle has a body which is shaped like a bottle, and there may be any number of holes and ports that allow the hummingbirds to feed. A dish type feeder involves a flatter dish, and this is covered with a lid that has small openings for the bird to access the nectar through. Each type has certain advantages and drawbacks, and many bird feeding tips advise that the dish type can be more effective at preventing bees and wasps but may not be as ornate or decorative.